This Persistence Market Research report examines the global tankless water heater market for the forecast period 2017–2024. The primary objective of the report is to identify opportunities in the market and present updates and insights pertaining to various segments of the global tankless water heater market. To understand and assess opportunities in this market, the report is categorically divided into six key sections namely on the basis of technology, energy source, energy factor, location, end-user and region. The report analyses the global tankless water heater market in terms of value (US$ Mn) and volume (‘000 Units). The report begins with an overview of the global tankless water heater market, evaluating market performance in terms of revenue and volume, followed by PMR’s analysis of key trends, drivers, and restraints witnessed in the global market. Impact analysis of key growth drivers and restraints based on the weighted average model is also included in the report to equip clients with crystal-clear, decision-making insights. To deduce the market size, in-depth secondary research is carried out. Data points such as regional splits and market split by technology, energy source, energy factor, location, end user as well as qualitative inputs from primary respondents have been assimilated to arrive at appropriate market estimates. The report comprises the forecast of the global revenue generated by the sales of tankless water heater. Persistence Market Research triangulates the data via a different analysis based on the supply side, demand side as well as dynamics of tankless water heater market. PMR provides forecasts in terms of value and also evaluates the market on the basis of essential parameters, such as Year-on-Year (Y-o-Y) growth. This helps providers understand future opportunities as well trends in the market. Another vital feature of this report is the analysis of the tankless water heater market by region, technology, energy source, energy factors, locations and end users, along with corresponding revenue forecast in terms of absolute dollar opportunity. This is usually overlooked while forecasting the market. However, absolute dollar opportunity is critical in assessing the level of opportunity that a provider can look to achieve as well as to identify potential resources from a sales perspective of the global tankless water heater market. To understand key segments in terms of their growth and performance in the tankless water heater market, Persistence Market Research has developed a market attractiveness index. The resulting index should help providers identify existing market opportunities in the global tankless water heater market. 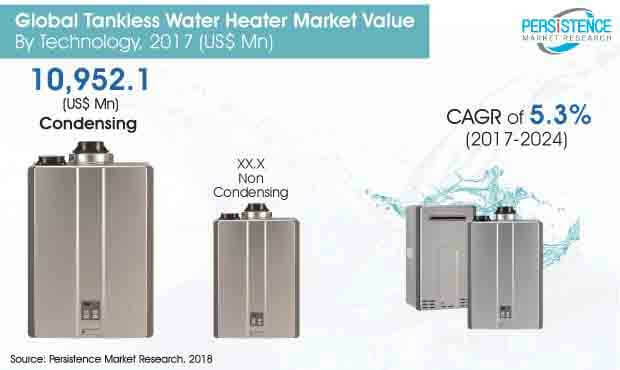 Another part of the report features the competition landscape of the global tankless water heater market and has information on the key players operating in this market. The competition landscape contains detailed information on the important companies operating in the global tankless water heater market in the form of company description, product overview, key developments, strategic overview and key financials of each of the featured companies along with the SWOT analysis of the companies. This competition landscape is a valuable part of the report as it contains all the necessary information to study the leading companies operating in the global tankless water heater market in detail and also reveals how they implement their strategies and vision to stay at top in this highly competitive market. Emerging economies with significantly large population such as China, India, and South Africa are witnessing robust growth in construction activities. Long term strategic government plans and initiatives, coupled with positive industrial outlook of various business sectors, are anticipated to be the prime factors driving growth in construction and manufacturing activities in such emerging economies. Steady raw material prices, increasing disposable income, and favorable schemes related to home loans are factors expected to promote home owners to invest on purchasing new homes, which is estimated to further drive growth of the global tankless water heater market over the forecast period. Government initiatives to achieve sustainability goals by promoting energy efficient systems are factors driving growth of the tankless water heating market. The minimum energy efficiency standards recommended for home appliances by governments all over the world are creating new growth opportunities for energy efficient and sustainable solutions, such as tankless water heaters. The energy saving capability of tankless water heater can be witnessed by its high Energy Factor (EF) rating, in view of which special rebates and tax concessions are provided for appropriate tankless water heating equipment. In April 2015, as a part of the National Appliance Energy Conservation Act (NAECA), The U.S. Department of Energy issued new energy standards for water heaters. These standards necessitate higher Energy Factor (EF) ratings, which is further driving demand for new energy efficient heater products such as condensed tankless water heaters. Large scale manufacturing has been witnessed in the water heater market in recent years, primarily due to activities such as capacity expansion, mergers, and acquisitions of prominent tankless water heater manufacturers by other manufacturers, which is helping to lower the overall cost of tankless water heaters. While price is expected to be the most dominant decision making factor in the water heater selection process, large scale manufacturing is estimated to be another major factor driving growth of the tankless water market, as it will create an opportunity for price-conscious middle class population in the near future. Solar-based water heating systems are considered to be a low maintenance and cost effective technology as after sales operational cost is minimum as compared to other types of water heating systems. High initial capital investment and productivity are considered to be the major restraining factors for growth of the solar water heating systems. Besides, the recent government policies to promote sustainability by providing subsidies and rebates are expected to further slower growth of the global tankless water heaters market in near future. Recent developments in the solar water heating technology as well as large scale manufacturing are helping in steadily lowering the cost of solar water heating systems as compared to the tankless water heaters systems. Condensing segment accounted for approximately 60 percent in global tankless water heater market value by end of 2017, and expected to exhibit fastest growth. The condensing segment is expected to remain dominant over the forecast period and anticipated to account for 68.8% of the market, gaining a significant market share by the end of 2024. Condensing type tankless water heaters are more energy efficient when compared with non-condensing tankless water heater which is gaining significant penetration in emerging economies. Haier Electronics Group Co, Ltd.